The cattail is widely known for the edibility of its starchy root, but this is not really my favorite part of the plant. I much prefer the green, sausage shaped flower heads that can be harvested in the spring. Break the entire flower head, including the stalk, off of the plant and boil it for 15 minutes. Put butter, salt, and pepper on the heads and eat them like corn-on-the-cob. Unfortunately the flower heads are only a good edible for a couple of weeks in the spring. There are few wild plants that are more versatile and more useful than the common cattail (Typha latifolia). The cattail provides food, shelter building material, cordage making material, medicine, and fire starting material; a pretty impressive array for such a common, wide ranging, and easily identifiable plant. The starchy root is available year round but don’t buy into the myth that you can dig it up and cook it like a potato. You will be disappointed at the tough, fibrous nature of the root. The best way to take advantage of the starch in the cattail root is to peal of the outer layer off the root, wash the root thoroughly, and then pound it into a mush. Add water to the mush and you will be able to separate the root fibers from the starch. The starch will settle to the bottom of your bowl, and the excess water can then be carefully poured off. You can boil the remaining mush until it firms up a bit and then add butter, salt, and pepper to create a dish that is somewhat like mashed potatoes. Alternatively, you can use the starchy mush as a thickener for stews, or you can let it dry out completely to form a kind of cattail flour. If you cut a green cattail stalk down near the root, you can peel off the green outer layer; and you will find a clear, slimy liquid between the inner layers of the plant. This slime makes a soothing burn ointment. 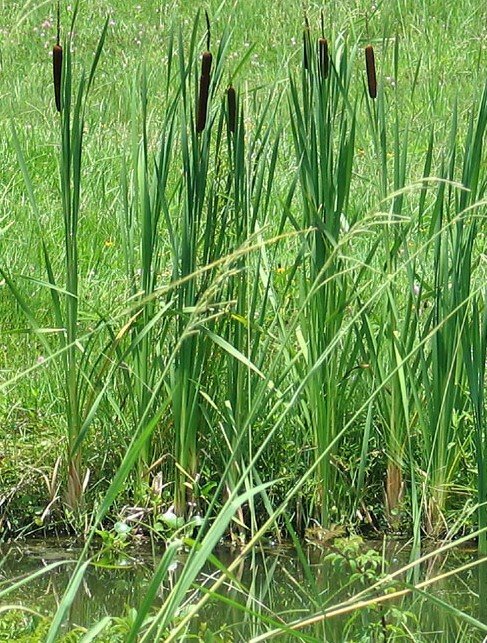 The leaves of the cattail are very useful for making cordage and baskets, but they cannot be used directly from the plant. The large amount of moisture in the leaves will cause them to burst if you try to twist them when they are still fresh. Pull or cut the leaves and lay them out in the sun for a day or two. This will remove enough moisture from them so that they can be twisted into cordage or woven into baskets. Cattail cordage is not strong enough to support much weight, but it is useful for tying together shelters, lashing items onto a pack board, or etc. 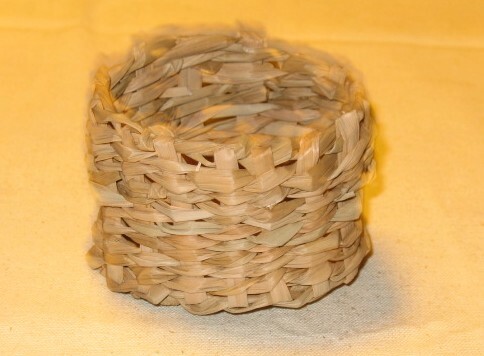 Photo below: Cattail basket. The dried fluff from the flower heads can be used for insulation, and it also makes a good addition to fire starting tinder. Cattail fluff will not flare up by itself, but it will catch a spark very well. Work some fluff into your shredded cedar bark tinder and it will catch a spark quickly and spread it through the tinder. Cattail stalks and leaves make good covering for a shelter. Gather the leaves and stalks into a three or four inch bundle and tie together with a wrap of cordage about six inches from the root end. Leave a few extra inches of cordage handing lose off of the bundle. Tie each bundle to the crossbars of you shelter frame with the points of the leaves hanging down. Start at the bottom of the framework covering the bottom completely, and then work up, overlapping the bundles like shingles. A well built shelter covered with these bundles will stay warm and dry. Dried bundles of cattail leaves can be tied together to form a sleeping mat that will insulate you from the ground. Instructions and illustrations for making a cattail sleeping mat will be included in a future post. A dried cattail stalk can be used as a hand drill (along with a yucca stalk fire board) for starting a fire by friction. I have started a fire using this method on a couple of occasions, and I can guarantee that once you’ve done it, you will never leave home without a disposable cigarette lighter again. Please send this information to everyone you can think of in famine control or anywhere in Africa or Asia. There are literally hundreds of megatons of cattails, rotting away and causing trouble in Africa and Asia. Their dessicating effect is a very large part of the process of desertification. Look at Lake Chad. More than 20,000 sq km of cattail clogging the basin. And it is Typha Australis, with a large rhizome. The wasted resource, and the troubles it is causing are maddening. What isn’t fit for human consumption can be made into fuel. Very interesting comment by SteveK. I used to study edible wild plants with a man who had a picture of some starving people in India (I believe). They were standing in front of a huge field of cattails. He used this picture to illustrate that you can starve from lack of knowledge just as easily as you can starve from lack of food.